Romerige Pasta Hoender(tjie) | What a Potjie! 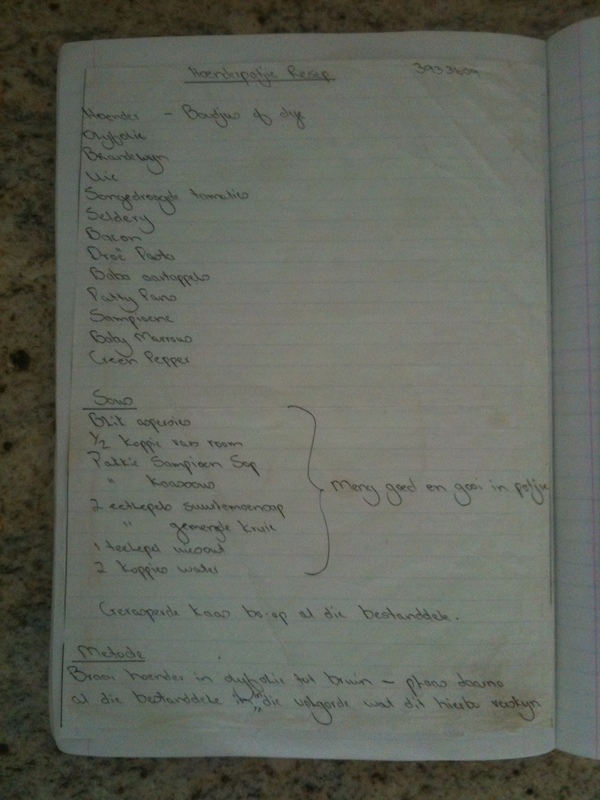 The written recipe, over 20 years old, taken from the program – “Maak n las” and slight modifications made over the years to ensure its always a winner. 1 can asparagus (410g), 1/2 cup fresh cream (room), 1 pakkie sampion (mushroom) soup, 1 pakkie Cheese sauce, 2 tbsp. spoons lemon pepper, 2 tbsp. 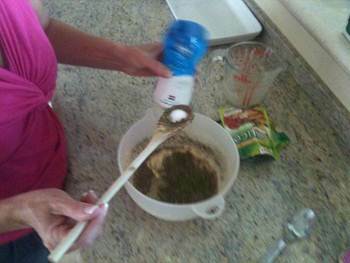 mixed herbs, 1 tsp onion salt, 2 cups water. Start fire with 20 Brickets. Once they start getting nice and hot (grey ash) add pot and let it warm up. Add Olive Oil and brown onions, garlic and green pepper (About 10 min). Add Chicken Pieces and brown chicken (about 10 min). Add half a cup of brandy (let it cook for about 5 min). Add approx 1/2 cup water. Add ingredients (slight change from what we did), add potatoes first, then follow putting ingredients in order as per recipe. 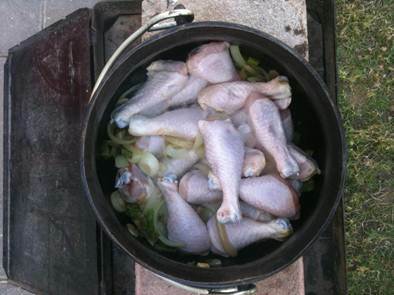 Sauce is made by combining all sauce ingredients and mixing it very well and then adding to the potjie – No stirring!! Close the lid and cook for about an hour and a half (or until baby potatoes nice and soft). Add grated Cheese and allow to cook for 5 more minutes. 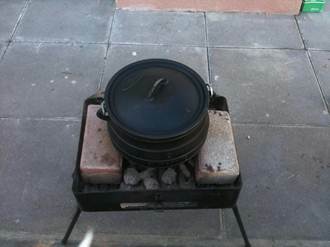 Add Bricketts throughout process to make sure Potjie continues cooking at same temperature (about 15 during the process). Note: Don’t make too hot or else Potjie will burn. Give it one good stir, and enjoy!! !